The koto (琴 or 箏) is a traditional Japanese stringed musical instrument, which came from China through Korea. The koto is the national instrument of Japan. It is made from a wood called paulownia ("kiri", in Japanese), and is about 6 feet long and about a foot wide. It is basically a long, wooden box with a round hole carved out of the underside at each end. That is where much of the sound comes out. This is called a "sound hole," and is found on many instruments, such as guitars, violins and the like. 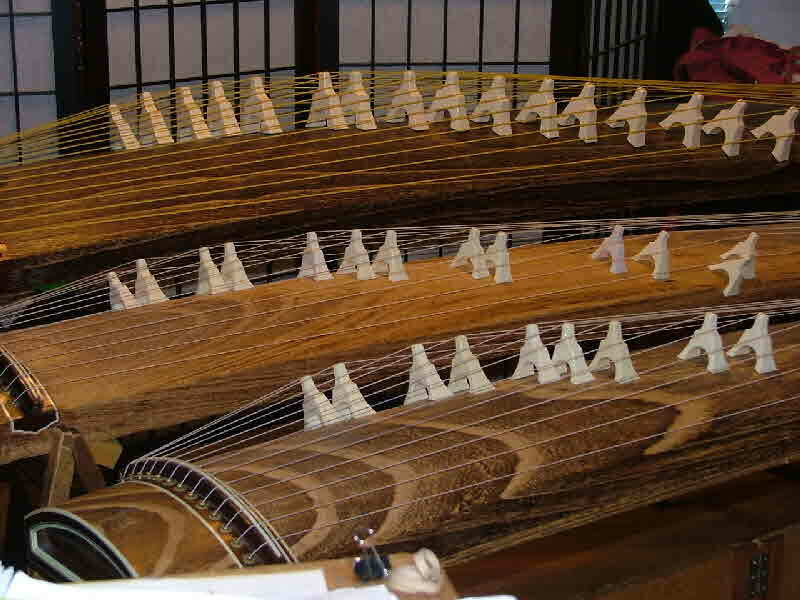 The koto is played using both hands, the right hand with three picks, called "tsume", made of plastic, and the left hand, which provides pizzicato sounds and also adds tonal shadings by bending notes, adding vibrato, and so on.